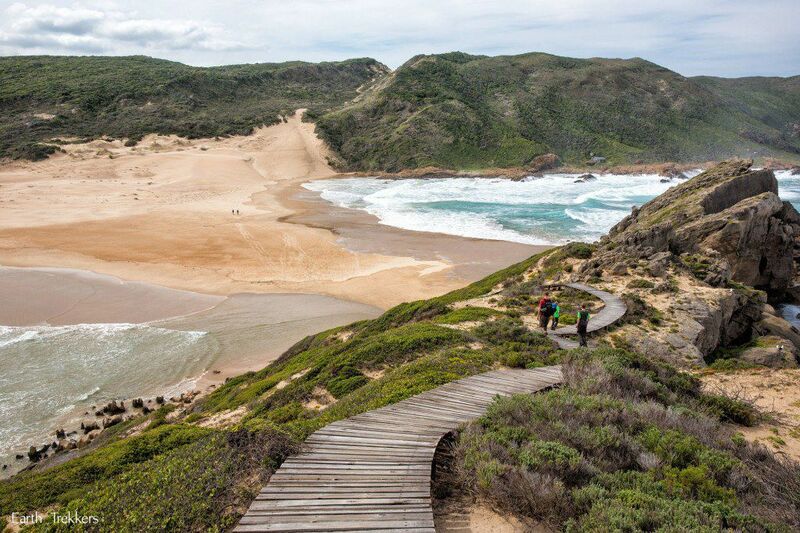 The Garden Route, a stretch of coastline along the southern coast of South Africa from Cape Town to Port Elizabeth, is home to a huge number of game reserves and animal sanctuaries. These animal sanctuaries, similar to zoos, offer opportunities to get up close with their animals. 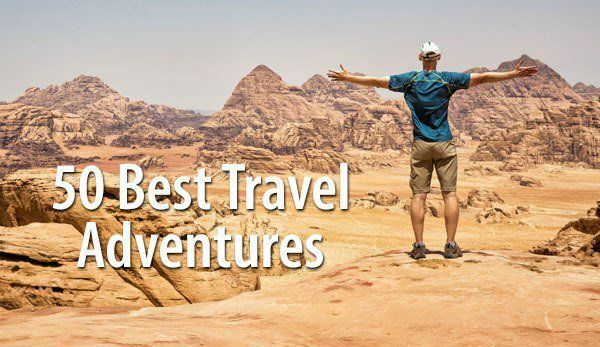 Our animal encounters with the elephants, lemurs, ostriches, and cheetahs were some of the funniest and most amazing experiences of our journey so far. The first of our animal adventures began on September 3, Kara’s tenth birthday. Rather than buying presents, we have decided to do something special to celebrate her birthday. 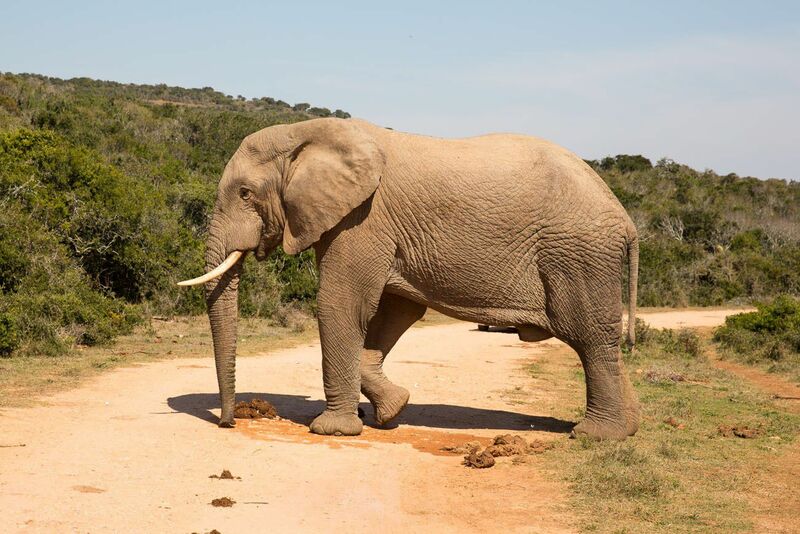 Kara’s favorite animal is the elephant, so we spent the day on safari at Addo Elephant Park. We saw elephants, lions, kudu, and lots of zebra and warthogs. 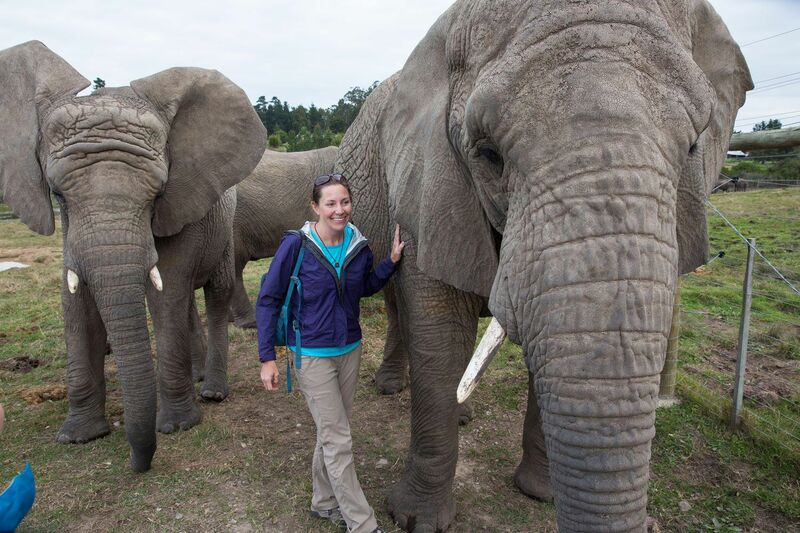 While in Africa, Kara was really hoping to get up close to the elephants. 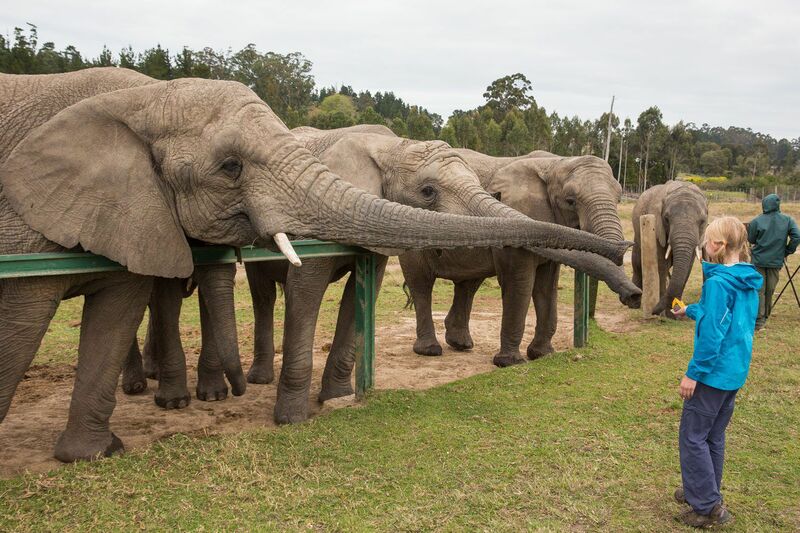 We were able to do this at Knysna Elephant Park, an elephant sanctuary that raises orphaned elephants. 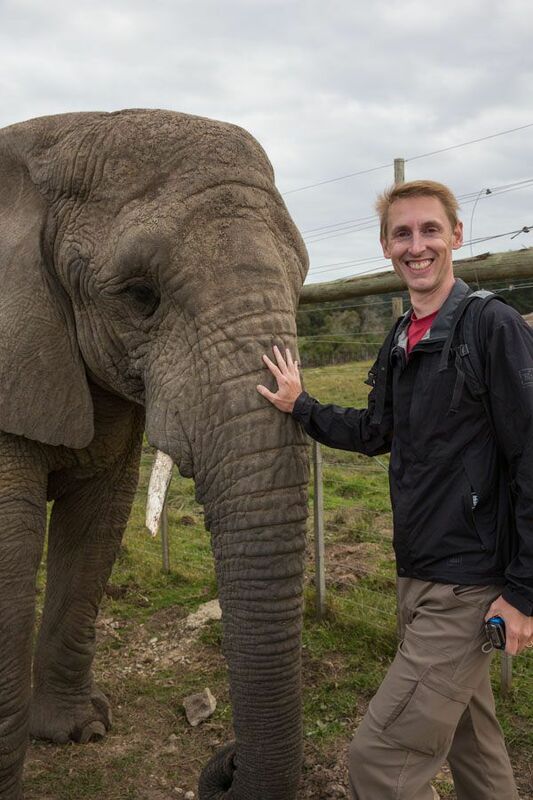 For $70 our family could feed and touch the elephants. We each took our bucket of food, a small white bucket filled with chopped carrots, apples, oranges, and squash, and rode the “African hayride” out to the elephants. 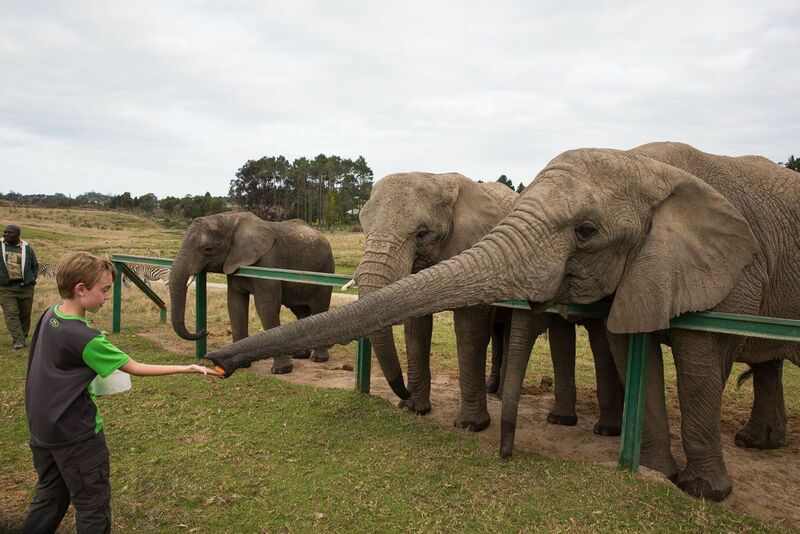 The elephants are trained to be fed by visitors like ourselves. As we got out of the vehicle the elephants practically came running over, eager for their treats. There was a long, metal fence the elephants knew to stand behind. Elephant handlers stood nearby, here to keep the elephants in line and to keep us safe. Feeding the elephants was hilarious and tons of fun. The elephants would reach out to us with their trunks, eager for a piece of food. I held out my hand with a piece of apple, the elephant grabbed it with its trunk, leaving dirty elephant slime all over my hand. It was so awesome!! One elephant flicked its trunk up, spraying my face with drops of mud. I wiped it off, laughing. I tried to feed the elephants while taking photos, getting dirt and slime all over my hands and the camera. I was having the time of my life!! Tim, Tyler, and Kara were having fun, too. Kara was smiling and laughing just like me. When one of us had a piece of food in our hand, all of the elephants stuck their trunks out, trying to knock nearby trunks out of their way. And what an amazing reach they had. I had no idea elephant trunks were so long! The feeding experience was tons of fun and over way too fast. After the feeding we had our chance to touch the elephants. Kara was not shy or scared at all, walking right up to them, touching their skin and trunks. The elephants’ skin is rough, thick, and covered with a sparse covering of hair. At times they would talk to us – emitting a low pitched rumbling from their chest. We were standing right next to the largest land mammals and it was awesome. 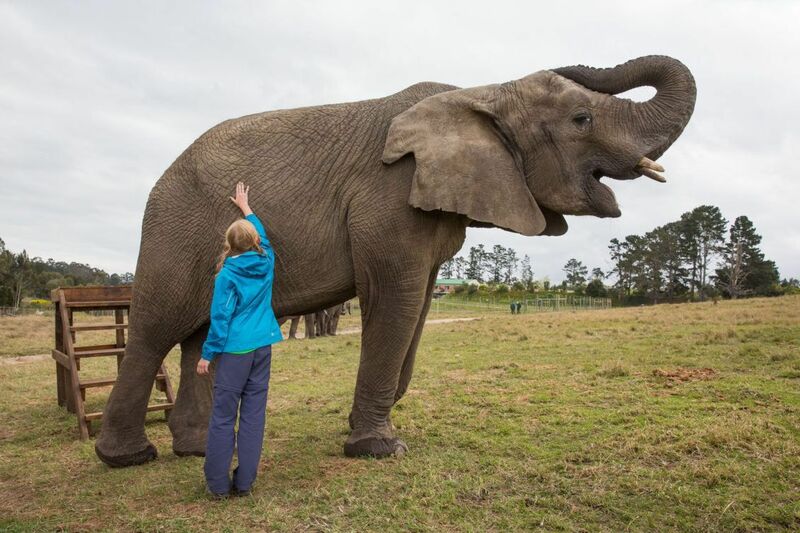 We left Knysna Elephant Park wondering how we would ever top this experience. The next animal encounter I did on my own. 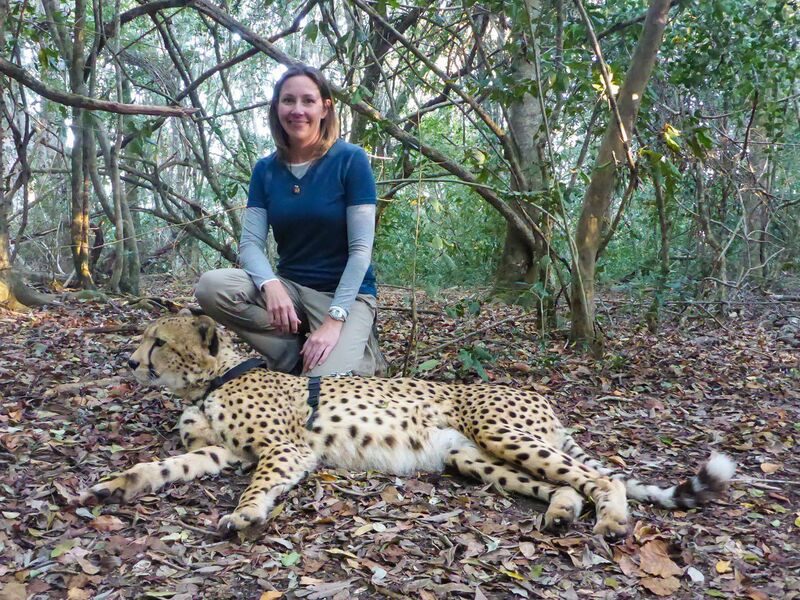 Tenikwa Animal Sanctuary offers a “Cheetah Walk” experience, where you can “walk a cheetah” for an hour and a half. In order to do this you must be over the age of 16. I guess cheetahs see smaller people as dinner. So I was on my own. What an amazing experience it was to get so close to a cheetah. They are so alert and so lithe. As I walked my cheetah I could totally see their potential for speed. 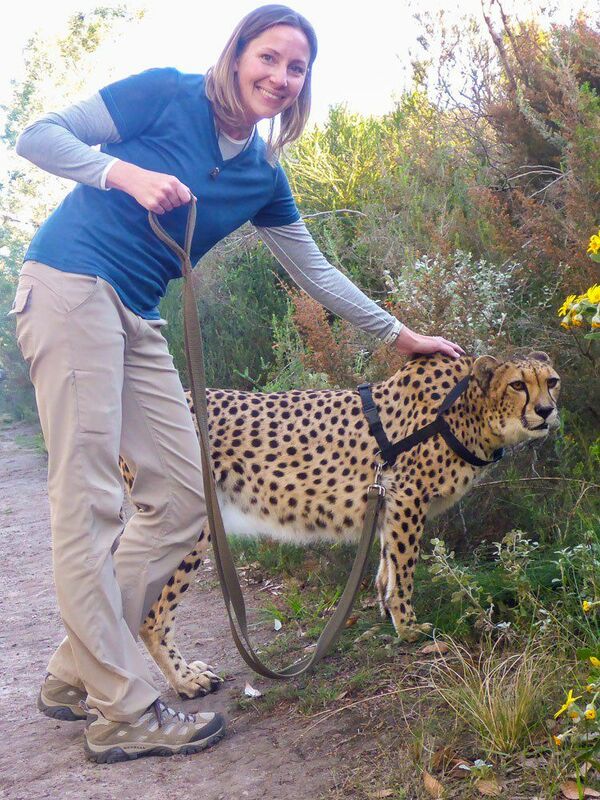 These animals are born to run and I was walking a cheetah on a simple leash. Like that would do anything if he wanted to get away. Walking a cheetah is not like walking a dog. A cheetah will walk about 200 meters and then just flop down on the ground, ready for a break. They are constantly conserving their energy in case they need to go sprinting after their dinner. 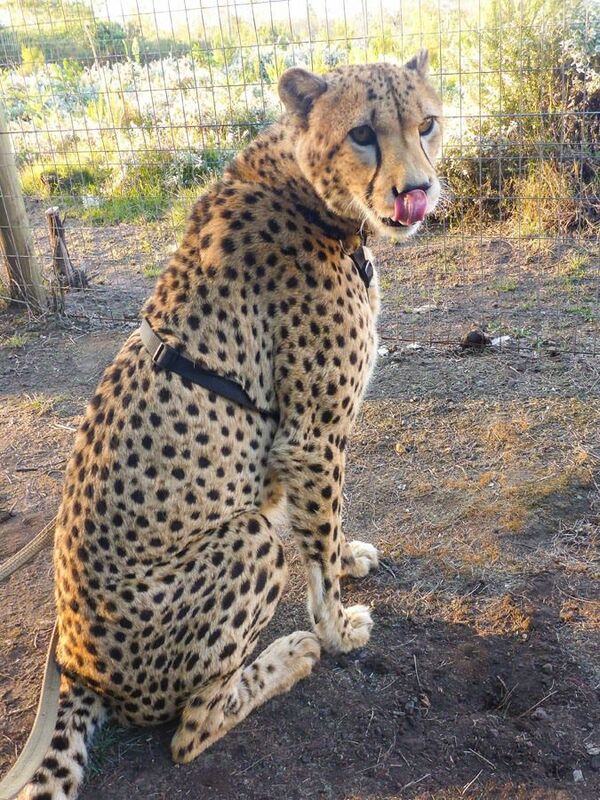 So the cheetah would sit, I would pet him, he would roll around on the ground, scratching his back. Then, he would be ready to walk again. I would say cheetahs are adorable, but an animal this lethal could never really be classified as adorable. Again, I loved every minute of this experience. 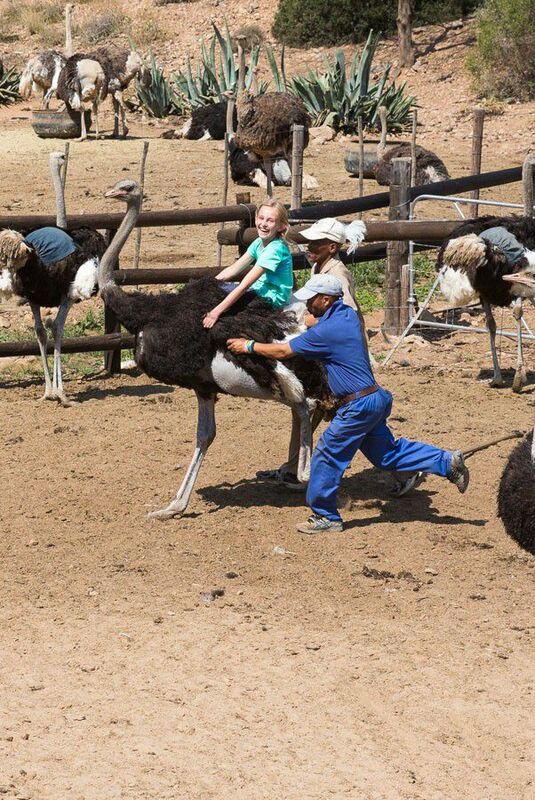 Our most amusing and hysterical hour of the entire trip was spent at Cango Ostrich Farm in Oudtshoorn, South Africa. The four of us laughed all the way through our one hour tour. Ostriches are very dumb animals but hilarious to interact with. 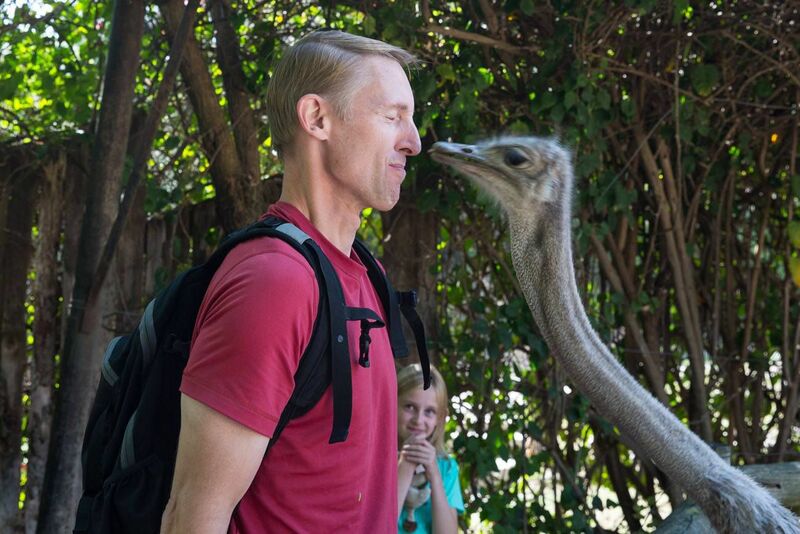 Our first real highlight was watching Tim get a “kiss” from a female ostrich. Tim held a piece of ostrich food between his teeth, closed his eyes, and awaited his kiss. The ostrich gave him a good look and then swooped in and pecked that small piece of food right out of Tim’s mouth. Next it was time to RIDE AN OSTRICH! 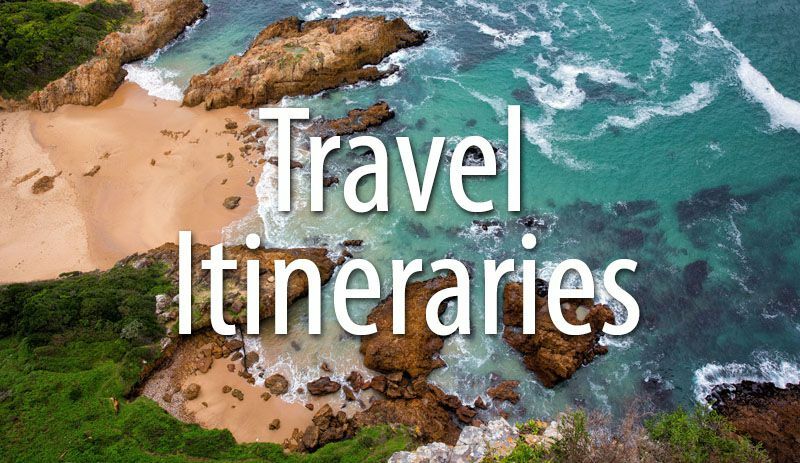 We had all been talking about this since January, when we first started planning the South African portion of the trip. The ostrich is caught by putting a bag over its head (if the ostrich can’t see you than he thinks you can’t see him) and led into a triangular shaped box. We climb on, similar to sitting on a horse, holding onto the wings for balance. 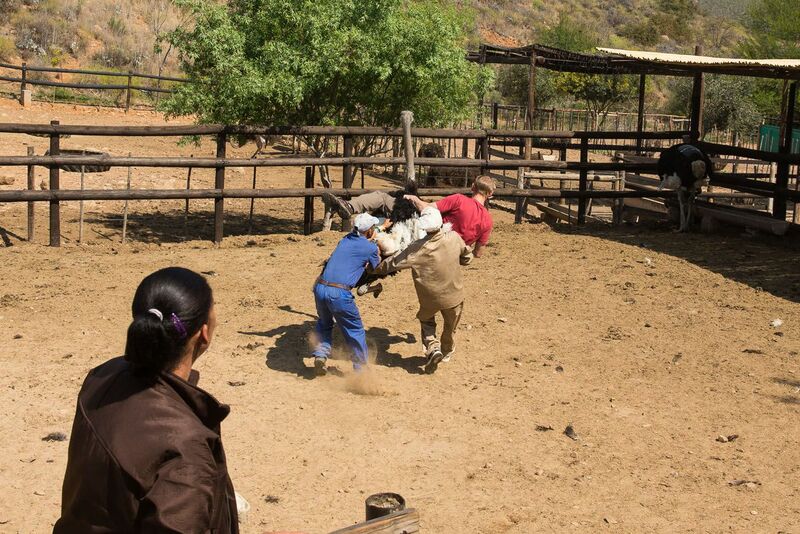 The bag is released from the ostrich’s head and then it was time for a ride around the pen. It was bouncy, unsteady, and tons of fun. We all had fun, even Tim, who fell off the back of his ostrich. Next, our guide told us it was time for a neck massage. We had no idea what that meant. She picked me to go first and I had no idea what I was in for. 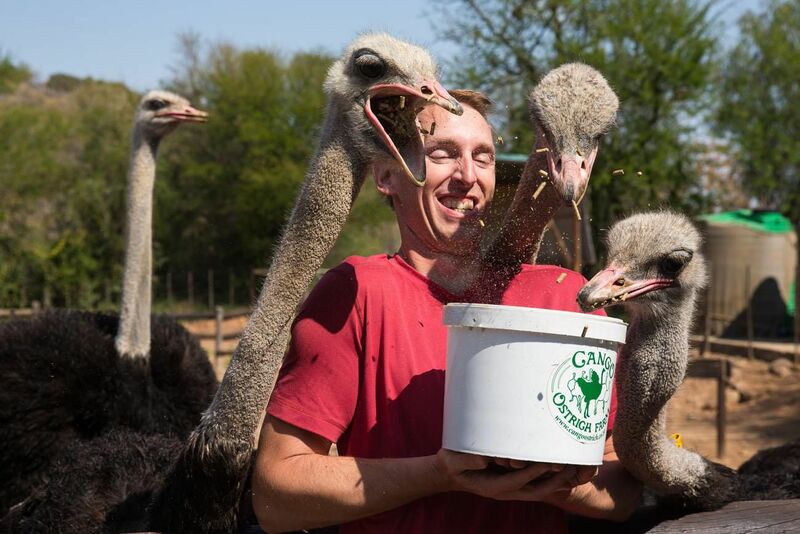 I held a bucket of food in front of my chest and backed up against the fence of an ostrich pen. 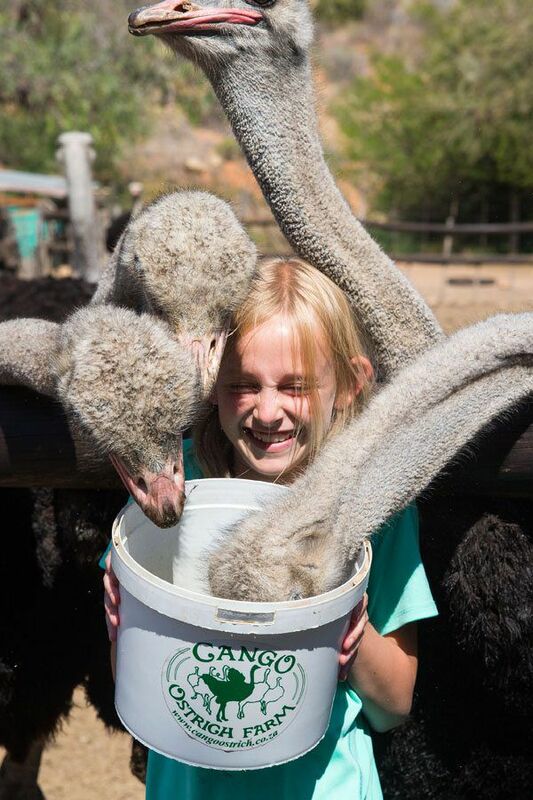 These ostriches proceeded to almost violently grab mouthfuls of the feed out of the bucket. There were at least six of them around me, knocking against my head and neck, and food pellets and dust were flying everywhere. My head just happened to be in the way of their precious food and they did not care if we bonked heads or not. I loved it! Tim and Kara went next, repeating the experience, laughing the entire time. But little Kara got pummeled by these giant birds. Because of her small size we could barely see Kara behind the swarm of hungry ostriches. Food and Kara’s hair were flying everywhere. 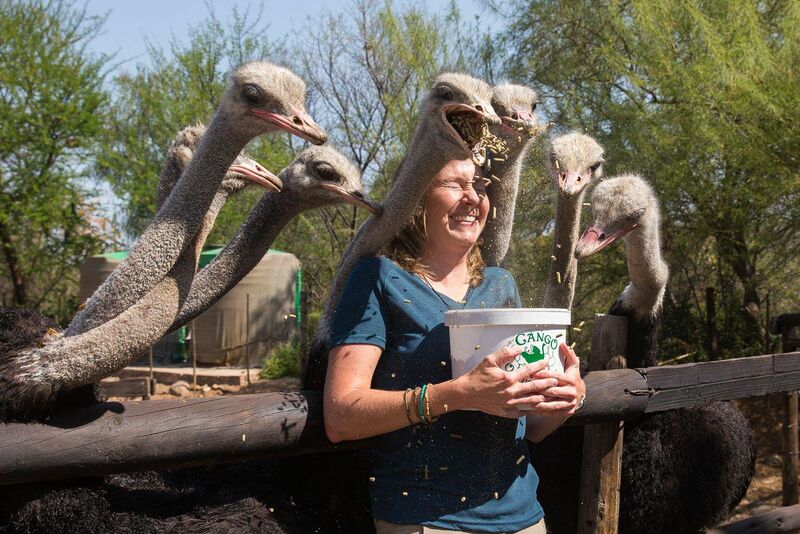 I think Kara was very relieved when the guide took away her bucket of food, releasing her from the onslaught of hungry ostriches. Our ostrich tour ended with Tyler and Kara standing on ostrich eggs. 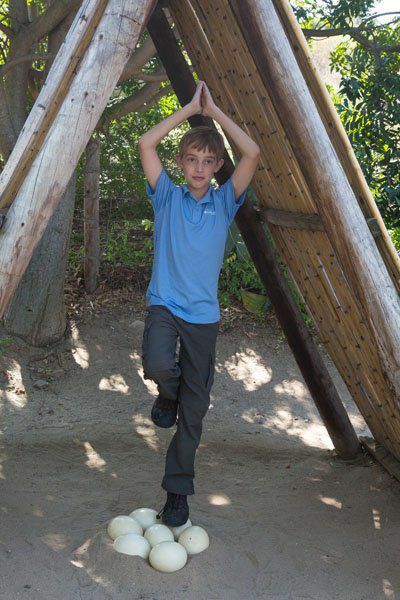 An ostrich egg can support the weight of a full grown adult and Tyler took the opportunity to pose while standing on these very large eggs. 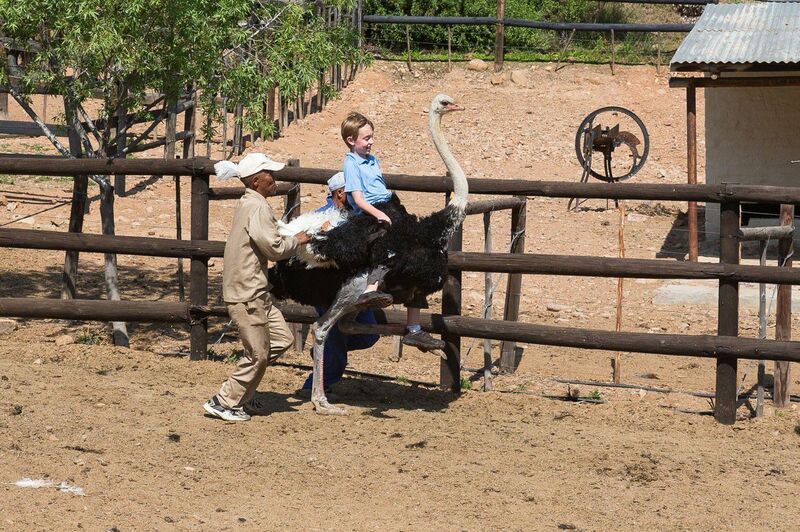 Our animal adventures continued just down the road from the ostrich farm at Cango Wildlife Ranch, also in Oudtshoorn. This is another animal sanctuary, also offering encounters with all sorts of animals. Cango Wildlife Ranch had three month old cheetahs, which were small enough that Kara and Tyler could get in their pen and play with them, without becoming dinner. These two young cheetahs, Pippa and Peyton, were very playful and very large for only being only three months old. The kittens would play for a little bit, then flop down on the ground and rest. This was Tyler and Kara’s chance to pet them and have their photo taken. 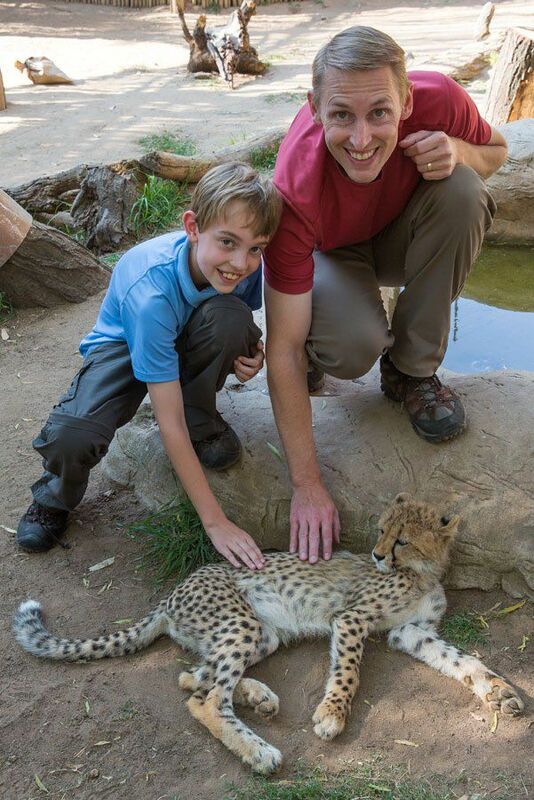 Tyler and Kara had to be accompanied by an adult, so Tim also got his chance to see the cheetahs. Tyler absolutely loved the cheetahs. He talked about this for the rest of the day. Our second animal encounter at Cango Wildlife Ranch was the Lemur Walk. It was my turn to go in with Tyler and Kara.We each took turns sitting on a bench while lemurs were lured to us with fruit. It is tons of fun having the lemurs walking all over you, messing up your hair, sitting on your head. 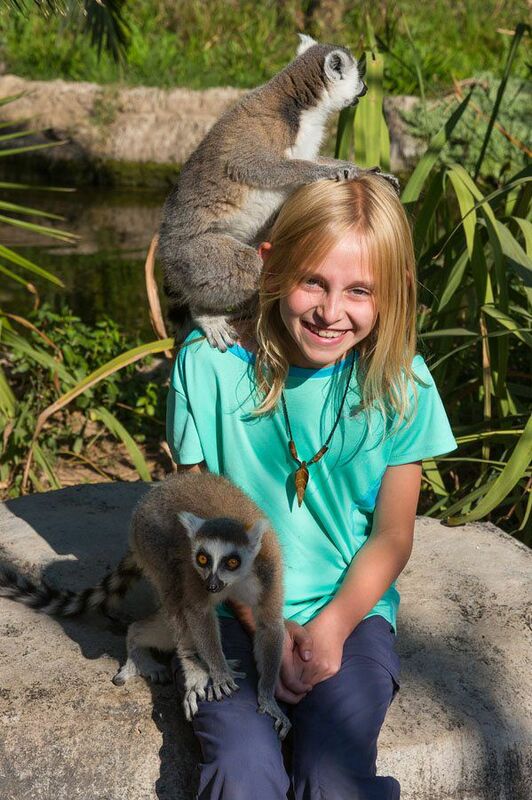 Kara was a big fan of the lemurs. Finally, we spent a morning watching meerkats in their natural habitat, also in Oudtshoorn. This did not turn out to be as worthwhile of an experience as I thought it would be. I have always been fascinated with meerkats, the way they interact with each other, and how these little animals hunt and kill scorpions and venomous snakes. So when I read that we could see them in the wild I was very excited to take this tour. The four of us met with Meerkat Adventures at 6:30 am and spent an hour watching the meerkats emerge from their den, warming themselves up in the sun. Once warm, they left their burrow, and us, foraging for food. Honestly, it was a let down. After the excitement and hilarity of our past animal experiences, this could not compare at all. I am glad that we did it, but I do not think it is worth the money that we paid. Our final animal encounter was Great White Shark tank diving in Gansbaai, South Africa. This was such a unique and amazing experience that it is its own post, and you can read about it here: White Shark Cage Diving in Gansbaai, South Africa. Knysna Elephant Park. 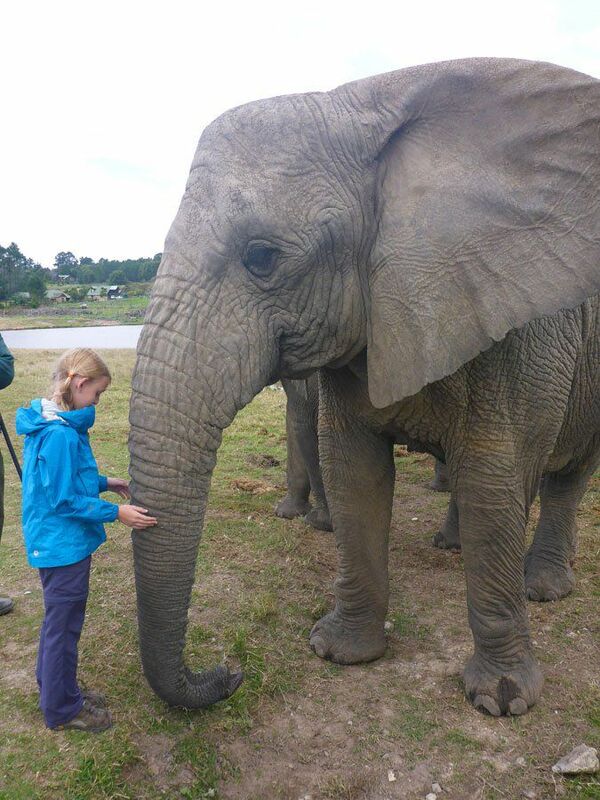 We took their “Be Touched by an Elephant” tour which includes feeding and getting up close to the elephants. I would recommend buying a bucket of food for each person in your group. Feeding the elephants is the highlight of the tour and it does not take the elephants long to eat a bucket of food. Tenikwa Animal Sanctuary. This is where I did the “Cheetah Walk.” The minimum age is 16 years old and it is offered at sunrise and sunset. They offer other animal encounters as well, some appropriate for children. Cango Ostrich Farm. 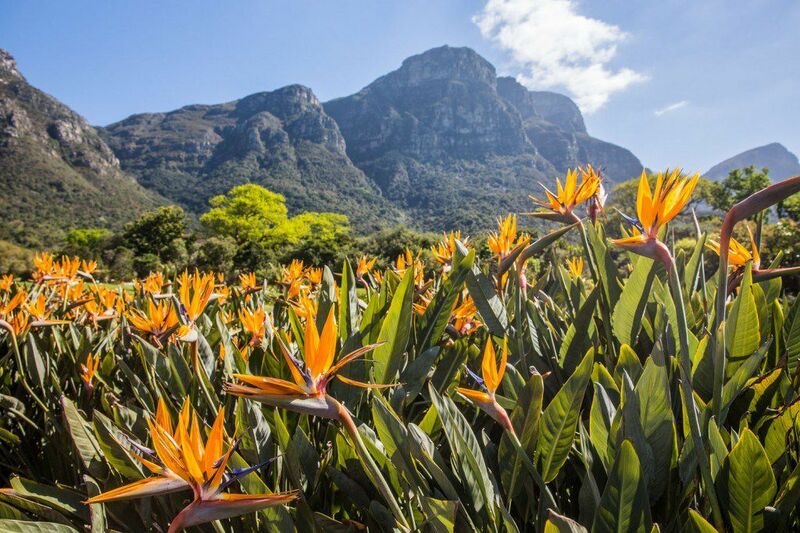 This is hilarious and must be added to a Garden Route itinerary. The standard one hour tour includes everything we did and more. Cango Wildlife Ranch. 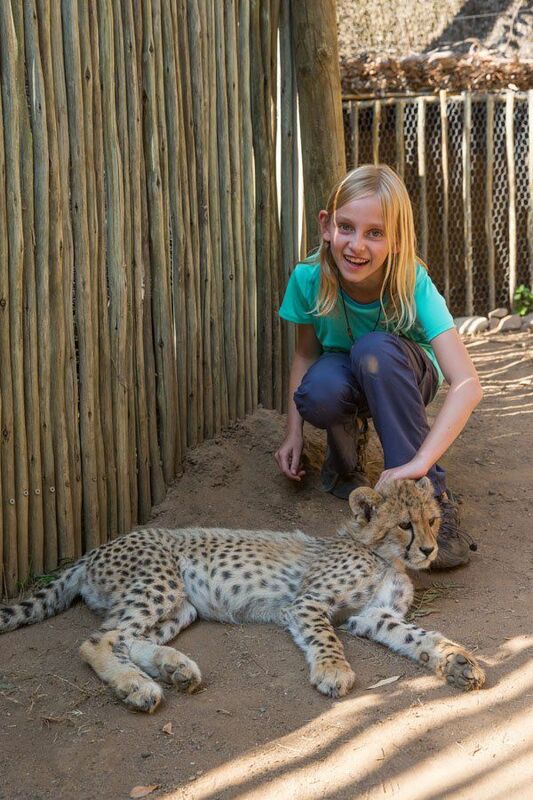 An animal sanctuary in Oudtshoorn. There is a mandatory but very informative one hour tour of the park. 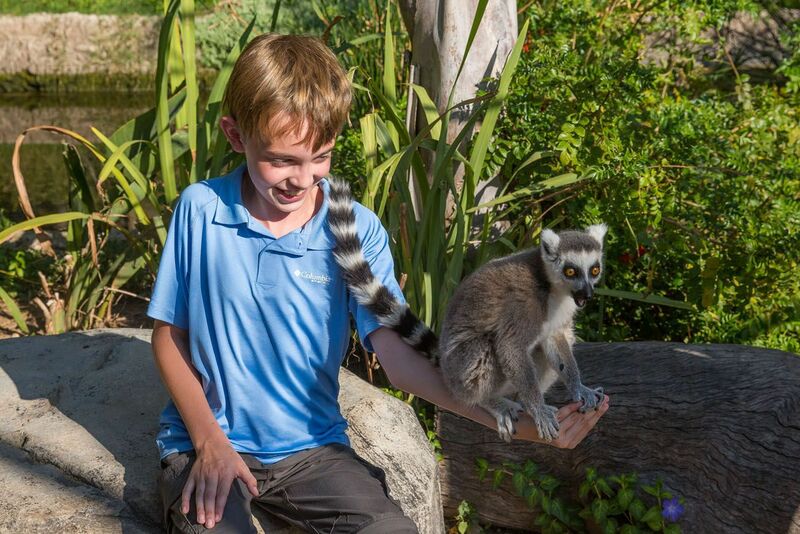 Afterwards you have the option to get up close with the animals: lemurs, cheetahs, white tigers, crocodiles, and more. Meerkat Adventures. 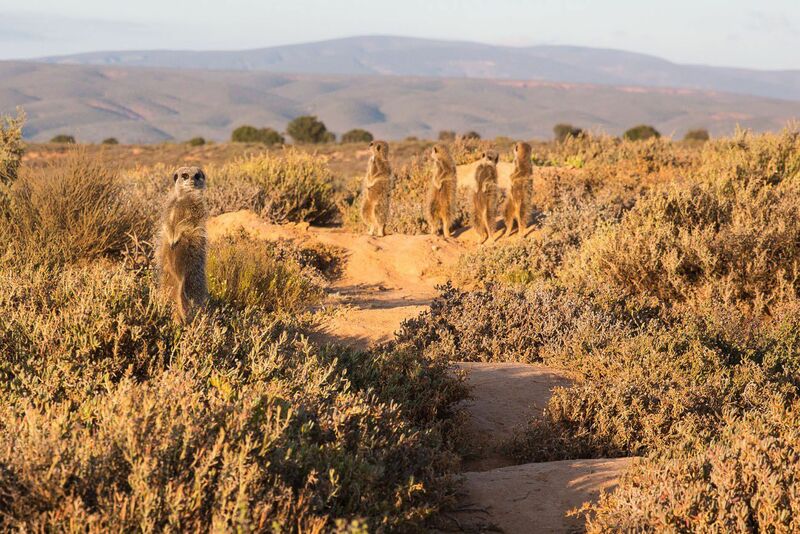 A sunrise tour of the meerkats’ natural habitat. Worth it if you are fascinated with meerkats but I think it is overpriced for what you get. Panorama Lodge. 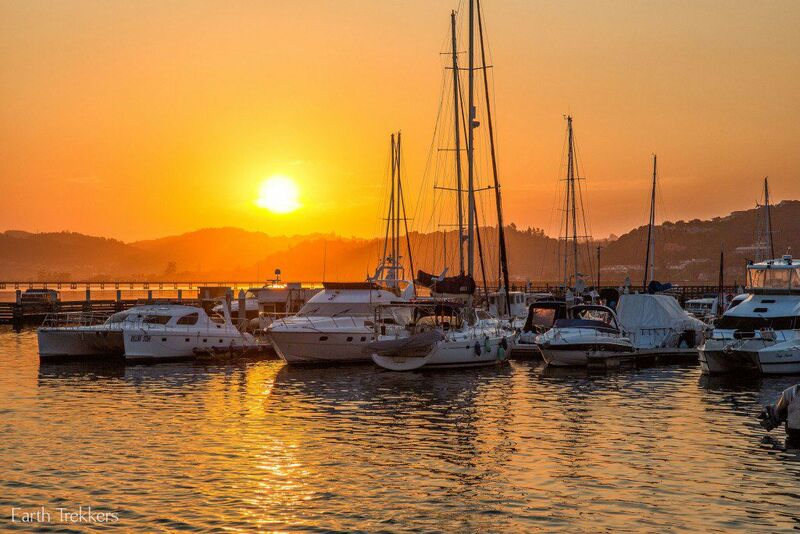 Located in Knysna, we stayed here for four nights, and it was one of our favorite accommodations on our trip around the world. 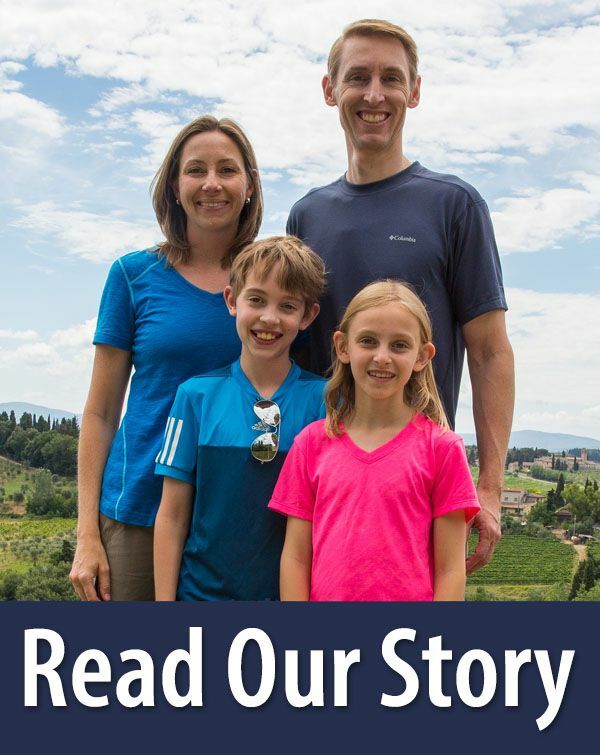 Our hosts, Dieter and Tina, made us feel like family in their home. 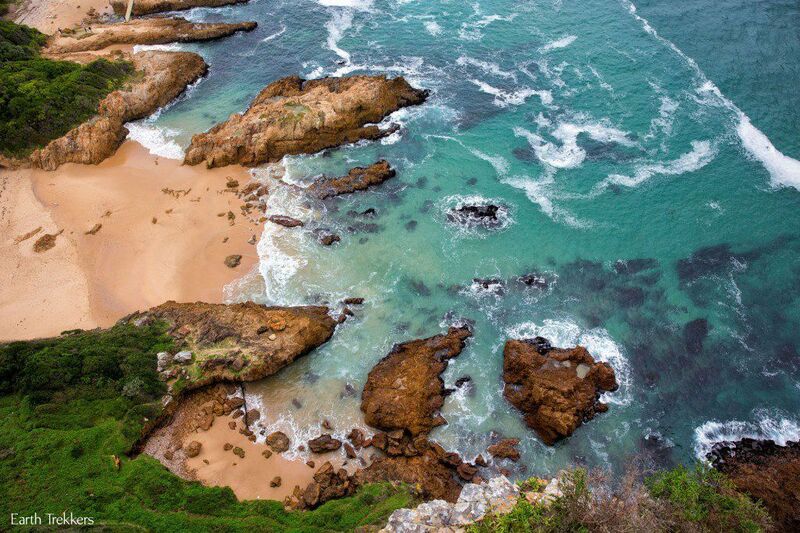 If passing through Knysna or Plettenberg Bay, I would highly recommend a stay here. Earthbound B&B. This place was awesome. It is a three star rated B&B but really should be four stars. Our suite included the most luxurious bathroom we’ve had yet, comfortable beds, and a small kitchenette, all at a budget price. We loved it here and wished we could have stayed more than one night. 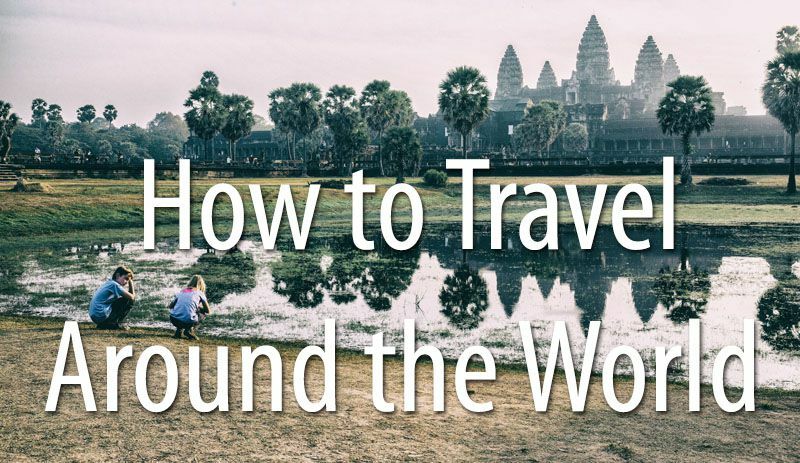 Great insight- we leave next week & Will be driving right through this area. I’ve been once and visited a few of the places you were. I agree with all the fun and laughs and I love how you described it off. 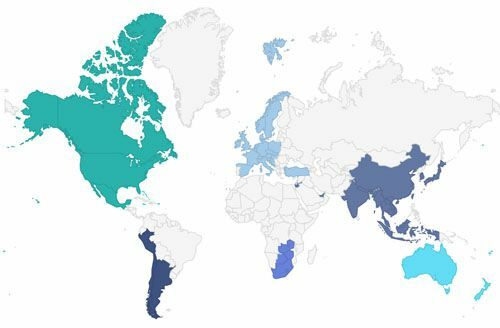 Thanks so much – happy travels! A birthday Kara will never forget! 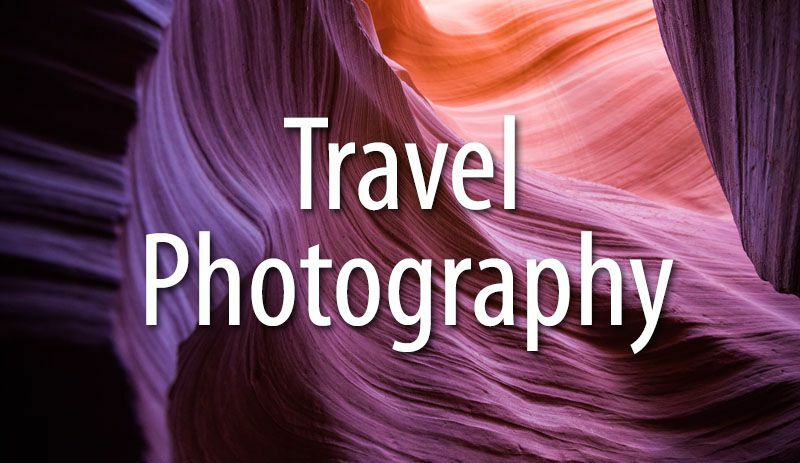 There’s no way I could choose a favorite picture because of the great selection, BUT, the one at the top of this blog with Kara reaching up to pat the elephant’s back is precious. I take that back, instead of buying a horse when you get home, I think you should buy an ostrich for the kids to ride. 🙂 As always Julie your pictures are beautiful. I love taking this journey with you. Happy belated birthday Kara!! Mark says Hi. Thank you! We are all having a blast. 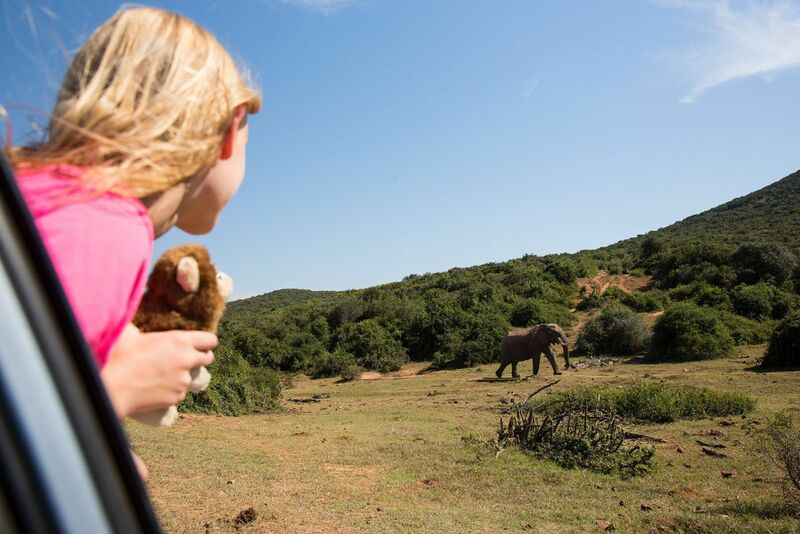 Getting this close to the animals has been one of our favorite things in Africa. Kara is having a lot of fun picking out your postcards. You should be getting one soon! Julie, you look so natural with those wild animals! But I don’t know about those ostriches, they look nasty to me but must be all right considering the fun you all were having. 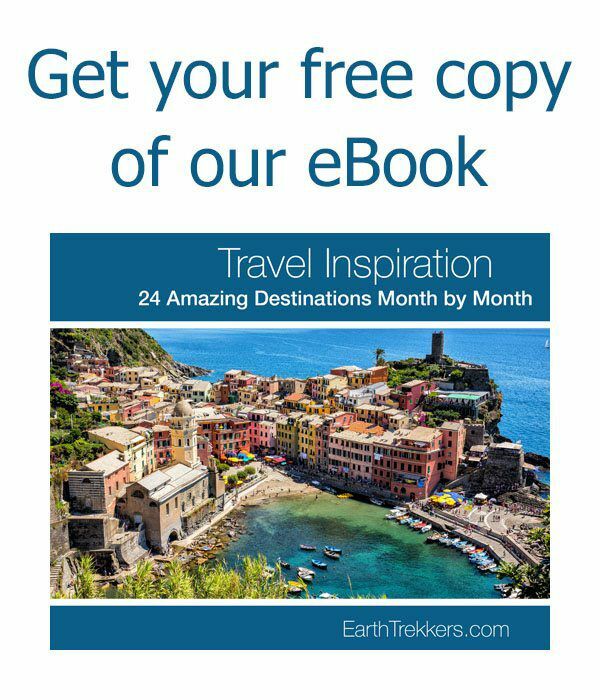 You’ve provided a nice guidebook for how to experience the animals up close. Glad to see you all having a good time.